Here's a kit I had serious reservations about, based on other peoples opinions, mostly warning about poor quality and near impossible fitting parts.. and for the most part, they were right; This was a finicky thing to assemble. 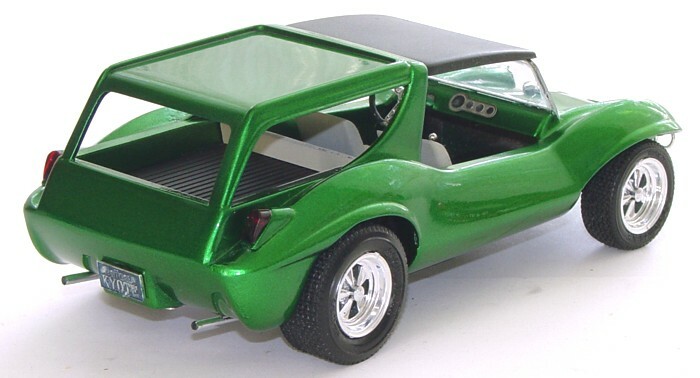 At first glance this looks like nothing more than the MPC Dean Jefferies KYOTE dune buggy (on the table) stretched with a top added. But, it's much more. 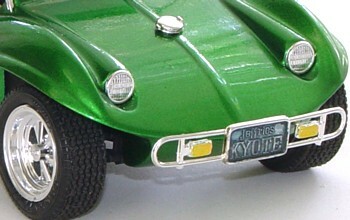 The headlights have been moved from the fenders to the hood, and the kit is designed to be built as shown or as a Camino/pickup or a wide open 4-seater. Some complaints I have are typical MPC quality. The clear windshield is flawed within the plastic itself, and the windshield frame HAD sport mirrors built in, but when raked back to meet the roof, the mirrors pointed to the rear wheels. 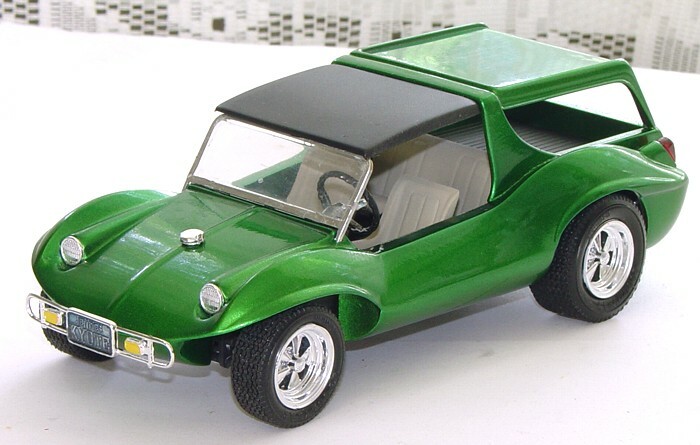 And speaking of the wheels, MPC always had those knobby points on the wheels where the tree attached. Complaints aside, this is a pretty sweet looking kit when assembled. 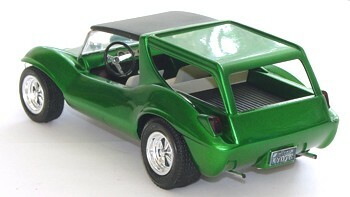 There is no engine detail; as you can't see more that the bottom when it's assembled anyway. Aside from the MCG gauges the kit is mostly box stock. I added a piece of ribbed plastic painted black to the "way back" to smooth it out. The seats are painted with tan suede paint from Plasti-Kote. The reflective surface, covered with Cobra Colors Candy Aqua over a Cosmic Gold base really comes to life with fill flash. The five piece main (lower) body seams were filled with automotive filler. It's a keeper!